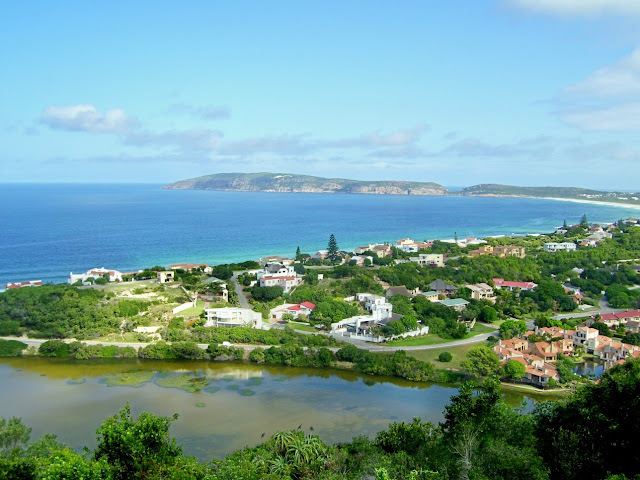 Plettenberg Bay is generally knows as a millionaires' playground. It was originally called Baia Formosa (Beautiful Bay) and is a popular holiday spot on the Southern Cape coast. There are a lot of adventure activities in the area and in season whale watching is at the top of most visitors' list. In the back of the photo one can see Robberg Peninsula while the Piesang River is seen in the foreground. Nature's Valley truly is one of the secret spots on the Garden Route. To get to it one has to get of the N2 highway and drive down the Groot River Pass to get to the coast. Nature's Valley is a very undeveloped holiday village with its main features being the lovely stretch of beach and the Groot River lagoon. 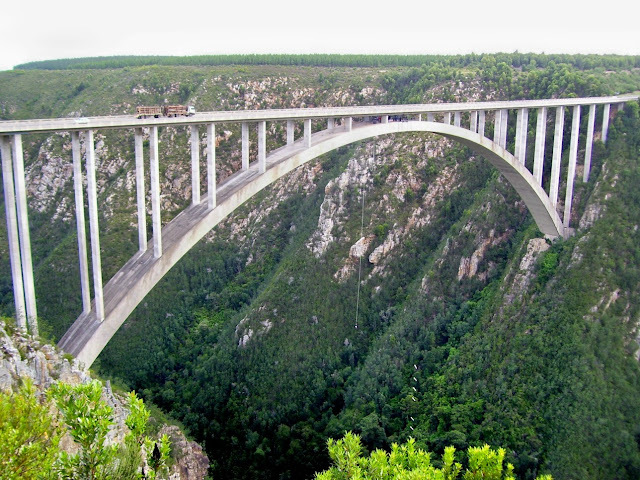 The Bloukrans River Bridge Bungi site is one of the highest commercial bungy jumps in the world. At 216 meters high it is enough to take your breath away. Jumpers first start by signing an indemnity form before being strapped into their harnesses. You can get to the middle of the bridge in one of two ways. 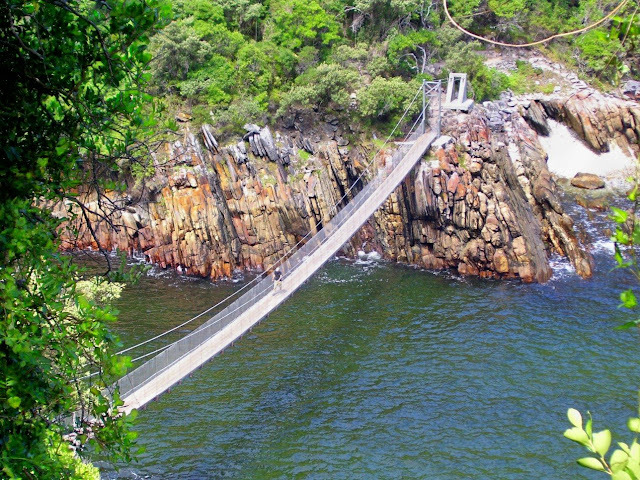 You can either take the cat walk which is attached to the side of the bridge or you take the quick way, the Flying Fox. In the middle you get prepped again before making the mind blowing leap. On the photo you can see a guy jumping. The cord is just visible as a thin white line under the bridge. The Tsitsikamma National Park is definitively one of my absolute favorite places on the Garden Route. It is a awesome park with such contrast and natural beauty, its hard to find anything better anywhere else. Forests, towering cliffs, black rock coastline, white waves, blue ocean, streams, beaches... I can go on and on. 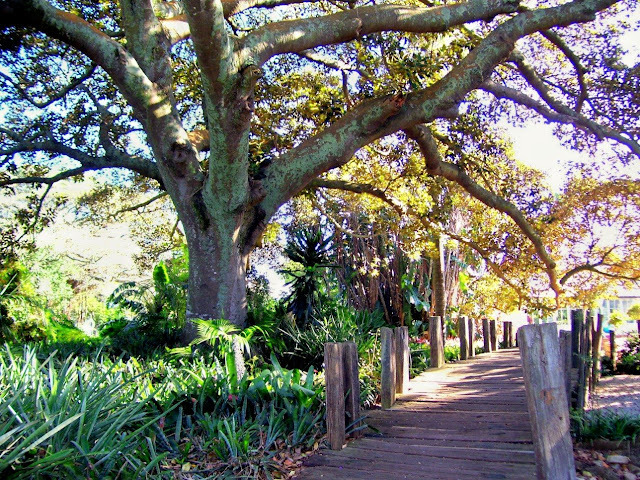 The park is a very popular stop for tourists travelling the Garden Route. I have done several posts on it on my other blog. These can be found here. 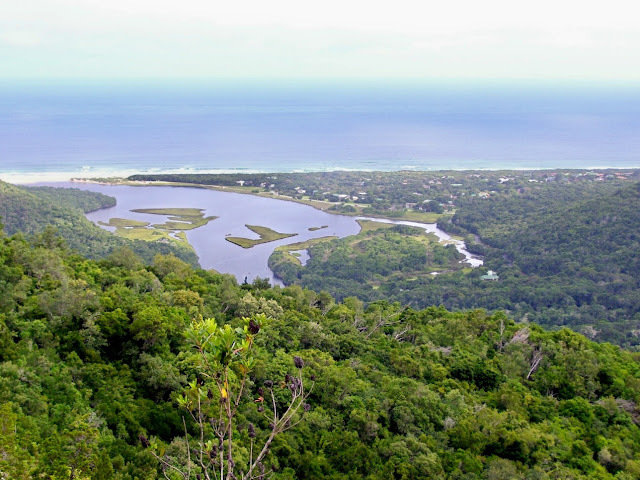 The Tsitsikamma (Khoisan word meaning "Place of many waters") is the official start of the Garden Route. The Garden Route is one of South Africa's most popular tourist routes and follow the south coast from the Tsitsikamma to Mossel Bay. For travel and tourist purposes a Garden Route tour will take you from Port Elizabeth to Cape Town or the other way around.. 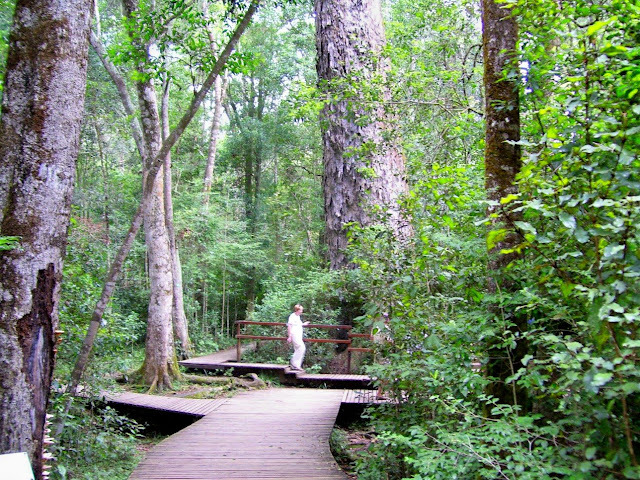 The Tsitsikamma forest is a indigenous forest which are highly protected by law. It consist of indigenous trees like the Outeniqua and Real Yellowwoods and other hard wood trees. Some of the Yellowwoods in the forest is over 800 years old. One of these is The Big Tree which can be reached by following a boardwalk path through the forest. I love forests and and for me the Tsitsikamma forest is a magical place, both literally and figuratively. Walking through it you can feel the old magic of the forest and it always feels like a mythical creature can appear from behind the next tree. Maybe its just me. As long as I have my camera on hand when it does happen. I love Cape St Francis. I have done many posts on it on my other blog, The Firefly Photo Files. Cape St Francis started out many years ago as a fishing village, but today is a sought after holiday destination. It has miles of beaches and is just the place to unwind. For me one of the main attractions to the village is the Seal Point lighthouse of which I have probably taken more photos than just about anything else. 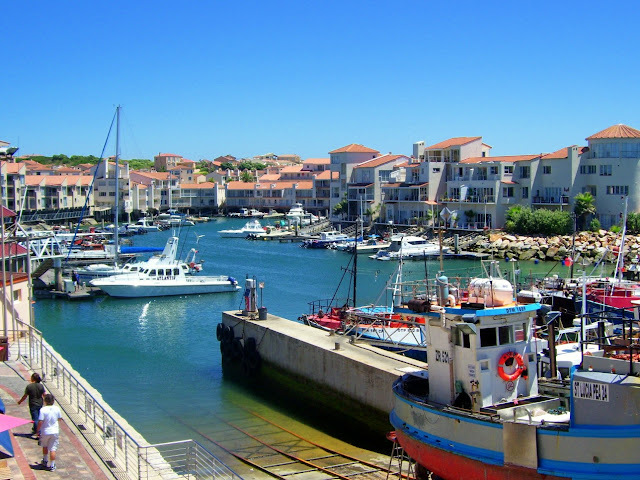 Port St Francis was developed in the late 1990's as a duel purpose small boat harbour. The one section of the harbour is used by fishing boats which consist mainly of chokka boats. Chokka is the squid that calamari is made of and is caught off this coast. Its also known as white gold. The other part of the harbour is used by recreational vessels. The development of the harbour created the opportunity to develop the surrounding area into an upmarket residential area as you can see in the background. 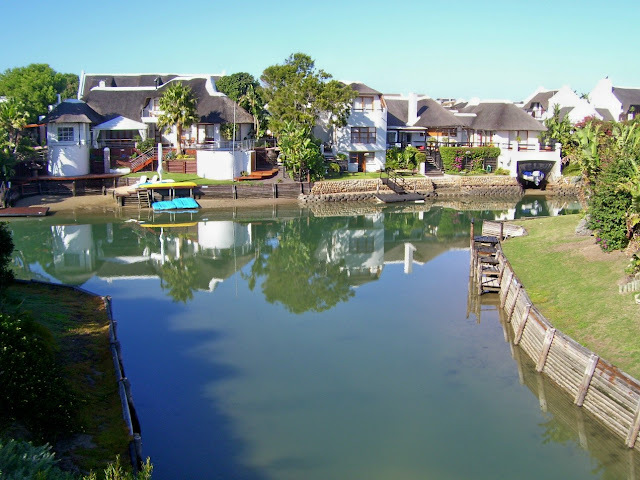 St Francis Bay is an upmarket village which was developed around a marina since the 1960's. Over the years it has become a popular destination for the rich and wealthy who buy the expensive thatched roof houses overlooking the canals as second homes. The village is very unique as the original owner of the land dictated that any building built on the land had to be black and white. Thus all the houses are brilliantly white with either thatch or black tiled roofs. Jeffreys Bay is the surfing mecca of South Africa and is situated about 65 km west of Port Elizabeth on thew way to the Garden Route. The town is home to the best right hand point break wave in the world and attracts international surfers to its legendary waves. Jeffreys Bay is also very well known for its shells and a visit to the Jeffreys Bay Shell Museum is a must. 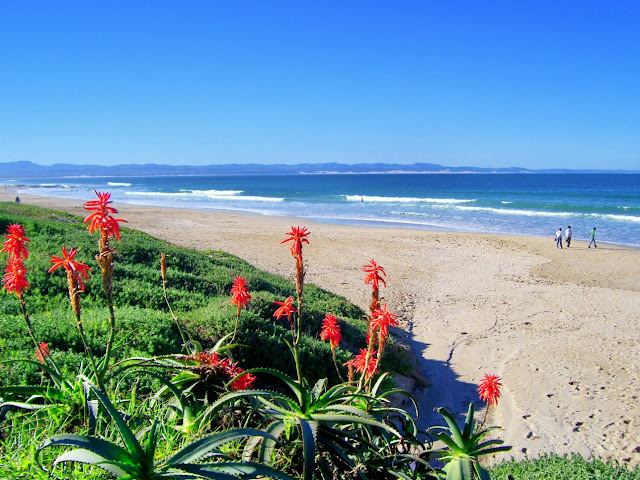 As with just about all the places on the coast in the Eastern and Southern Cape, J Bay (as everybody knows it) is very popular with holiday makers and gets packs to the brim over the summer holidays. 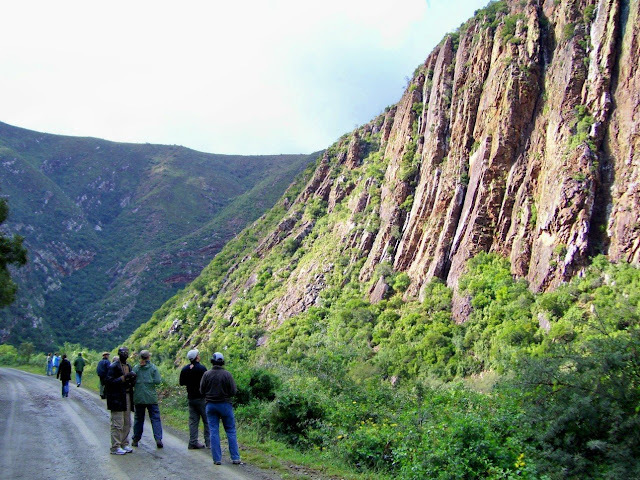 The Baviaanskloof Wilderness Area lies approximately 120 km west of Port Elizabeth and comprises of approximately 270 000 hactare of unspoiled, rugged mountainous terrain. Starting in the east at Komdomo, the road leads through the rugged beauty of the "Grootrivier" Gorge on its winding path through this pristine conservancy, all the way towards Willowmore in the west. A total distance of about 203 km. 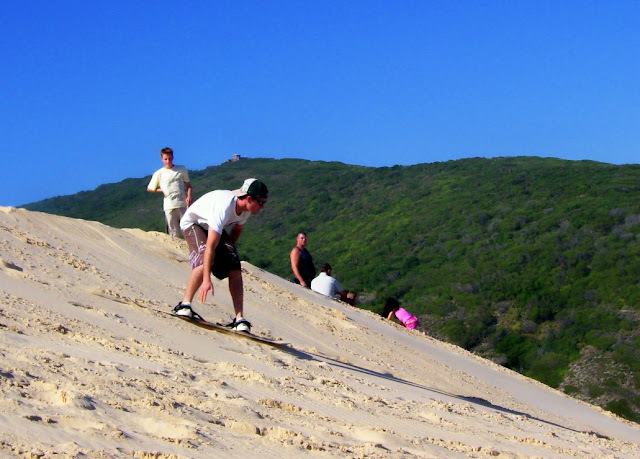 The area offers a wide range of eco-recreational opportunities as well as an unique wilderness experience! The Baviaanskloof is an UNESCO World Heritage Site as it was elected as one of the reserves to represent the Cape Floral Kingdom (fynbos) as a UNESCO site. The area is absolutely awesome and a nature lovers paradise. Unfortunately the road through the valley is only accessible with a high clearance 4x4 or offroad motorcycles. At the top of the Gamtoos Valley one would find the Kouga Dam, one of Port Elizabeth's three main water supply dams. The Kouga Dam was the first double arch dam to be built in South Africa. 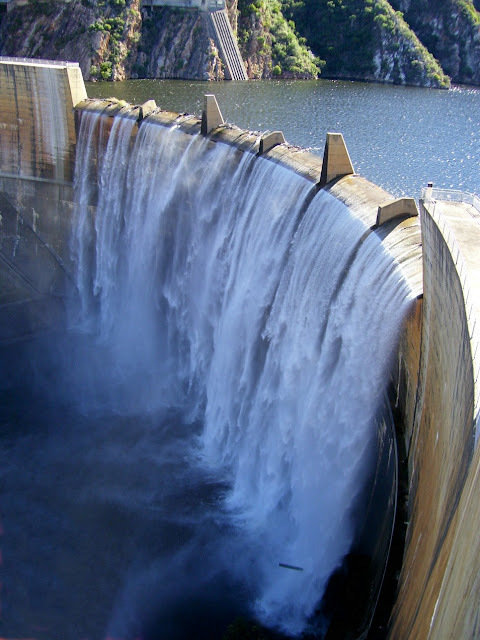 Other than for urban use, the dam is also the main supplier of irrigation water to the Gamtoos Valley. The pic was taken a little while ago when the dam last overflowed. More information on the dam can be found here. 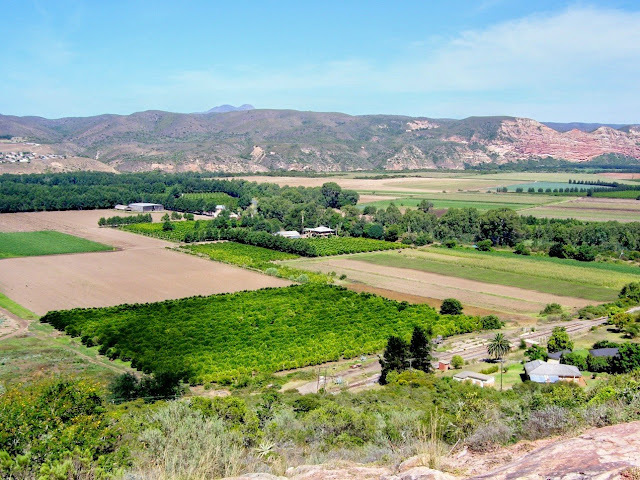 The Gamtoos River Valley is one of my favorite areas and is found to the west of Port Elizabeth.Known as the food basket of the Eastern Cape, it is mainly a farming area producing citrus, potatoes and tobacco with all kinds of other fruit and vegetables also being grown. Its is a very scenic area with loads of potential as a top nature and agricultural tourism destination. All along the road accommodation can be found on various farms while there are a couple of very pleasant farm stalls and country restaurants. The people have a special sense of hospitality which is hard to beat and is always willing to show visitors around. The chief town in the Gamtoos Valley is Patensie with the other two being Hankey and Loerie. 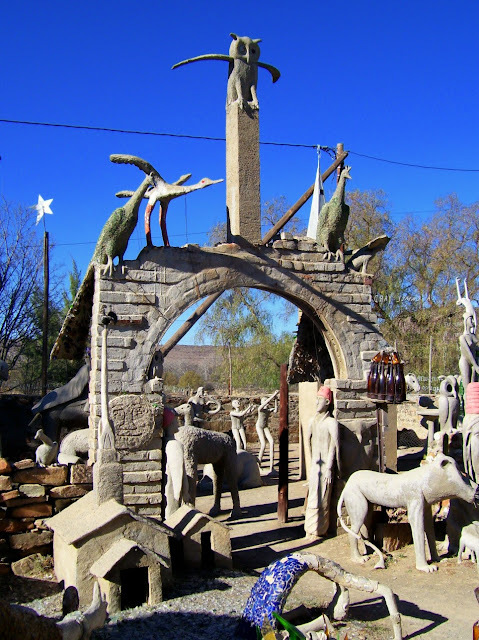 Cradock is situated about 280km north of Port Elizabeth. It is one of the chief centers of the wool industry of the Cape, and also produces beef, dairy, fruit, lucerne, and mohair. Close to the town visitor will find the Mountain Zebra National Park. The park plays a major role in the conservation of this highly endangered animal. 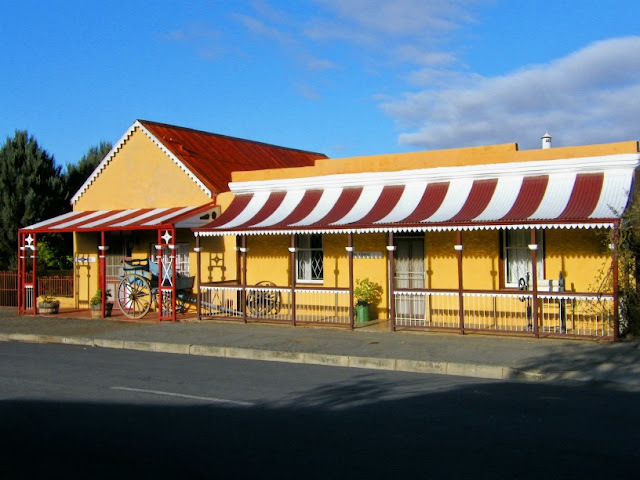 Die Tuishuise in Cradock consist of 30 refurbished Karoo style cottages ideally located in Market Street. These unique houses have been restored to their former splendour, recreating the gracious bygone era of the 1840's. Part of the complex is the historical Victoria Manor Hotel where guests can have their meals while staying in Die Tuishuise. The charming village of Nieu Bethesda is set in the fertile valley of the Sneeuberg Mountains. It is so secluded that development took a back seat leaving a rare historical integrity. It has become a popular retreat for artists and because of its unique appeal, this is a place that no visitor should miss. The main attraction in the town is the Owl House. The house itself was inherited by a woman named Helen Martins after her parents had died. According to sources, Martins became bored with her "dull" life and resolved to transform the environment around her. She began an obsessive project around 1945 to decorate her home and garden. Martins used cement, glass and wire to decorate the interior of her home and later build sculptures in her garden. Almost all the walls of the interior of the house were covered in decorative and colourful crushed glass. In 1964, she was joined in her work by a Coloured man named Koos Malgas, who helped her build the sculptures in her garden. Martins drew on inspiration from Christian biblical texts, the poetry of Omar Khayyam and various works by William Blake. The sculptures were predominantly owls, camels and people, mostly pointing toward the east as a tribute to Martins' fascination with The Orient. Her work was a source of suspicion and derision within the village and during her time, Helen Martins received very little support or enthusiasm about her work. Her lifelong exposure to the fine crushed glass she used to decorate her walls and ceilings caused her eyesight to start failing in 1976. She committed suicide on August 8, 1976 by ingesting caustic soda, aged 78. The Owl House has since been kept intact as a museum per Helen Martins' wishes and is now managed by the Owl House Foundation (founded 1996). Athol Fugard published a play in 1985 about the house called The Road to Mecca which was later made into a film of the same name. The house was declared a provisional national monument in 1991. 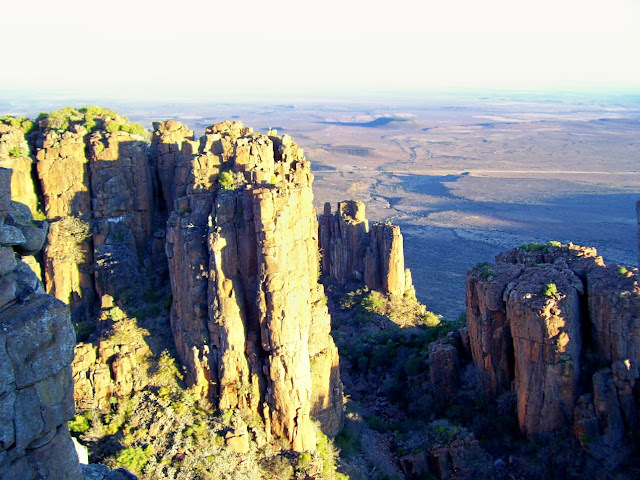 The Valley of Desolation is situated just outside the town of Graaff Reinet. It can be found in the Camdeboo National Park which provides the visitor with insights into the unique landscape and ecosystem of the Karoo, not to mention awesome scenic beauty. The Karoo was formed hundreds of millions of years ago and in some places, dolerite form jointed pillars. The best examples of which are found in the Valley of Desolation where erosion of the softer sedimentary beds has left dolerite pillars which rise to heights of 90 – 120 metres. There is nothing like standing at the top of the Valley of Desolation at sunset. 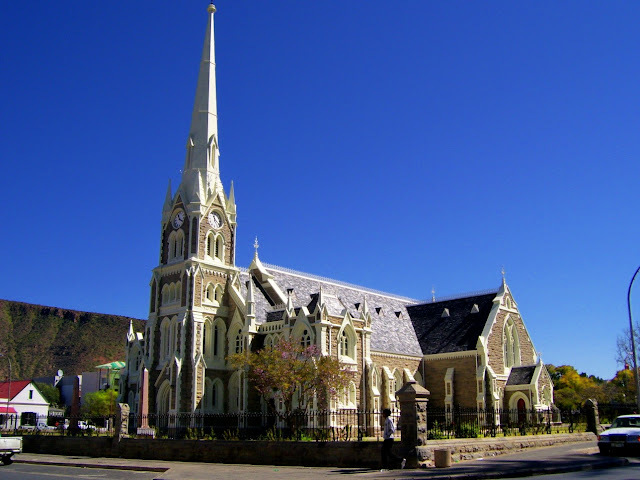 Graaff Reinet is the 4th oldest town in South Africa and is the Gem of the Karoo. The town lies 750 metres (2,500 ft) above the sea and is built in a horse shoe on the banks of the Sunday's River, which rises a little farther north on the southern slopes of the Sneeuberge. The town is quite an interesting one with a big amount of historical buildings and museums that has been restored over the years. It is also home to the biggest succulent nursery in the world. Like Grahamstown, this is one of my favorite old towns to explore. The Dutch Reformed church in the town is a prominent stone building in the main street with seating accommodation for 1500 people. The building is a reproduction of the Salisbury Cathedral. The picture was used by Paul du Plessis on The duPs as one of the photos to illustrate his poem Afrikaner Journey. The Addo Elephant National Park is situated just outside Port Elizabeth. The Southern Gate is only 30 minutes from town while the main rest camp is 75km away. 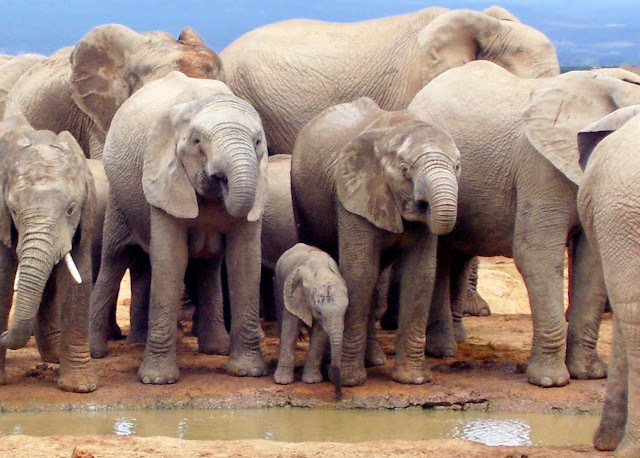 Addo is the third largest National Park in South Africa and home to nearly 500 elephants. Addo is probably the best place in the world where one can see wild African elephants in big numbers and up close. Addo is also tagged as the first Big 7 game reserve in the world. It boasts the Big 5 (elephant, lion, buffalo, rhino and leopard) as well as the Great White Shark and Southern Right Whale (in season) within its Marine Coastal Reserve. Their website can be found here. Over this last December summer holidays we camped for a week in the town of Cannon Rocks on the Sunshine Coast. It has endless beaches and doesn't get over crowded like the other coastal destinations in summer. 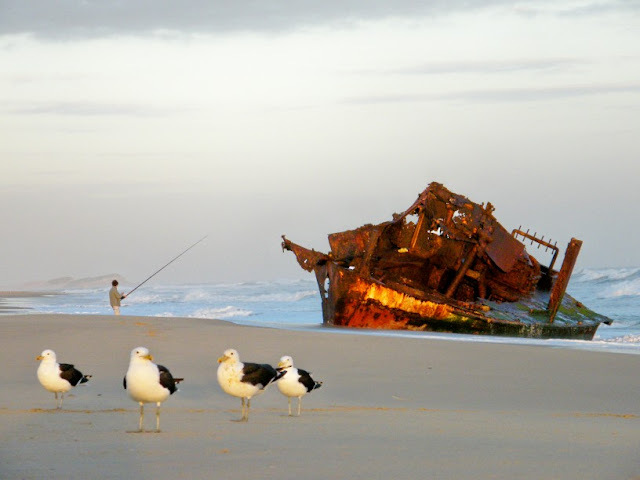 I also had an absolute ball with my camera with sunsets over the sea and specially the shipwreck of a fishing boat. For more pics of Cannon Rocks see here. This coming December we will be back there for a week. 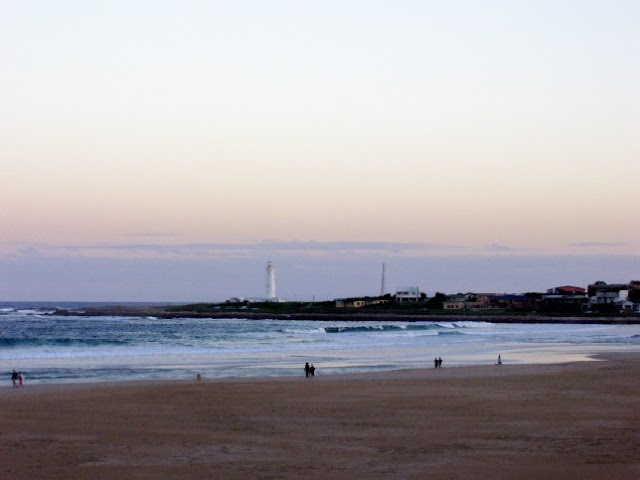 The town of Port Alfred is situated halfway (150km) between Port Elizabeth and East London in the heart of the Sunshine Coast. One of the town's most distinctive features is a beautiful marina with a number of luxurious houses facing onto the canals. Associated with the marina is a small boat harbour, providing mooring for a variety of vessels from luxury yachts and other pleasure craft, to sporting and commercial deep-sea fishing vessels. It is growing rapidly due to a high number of retirees and holiday makers building houses there. It is the kind of town which pulls the summer holiday makers to its beaches and river like a magnet. Port Alfred is also home to 43 Air School which was a training base for the Royal Air Force during the World War II. The little village of Bathurst is situated about 50km from Grahamstown towards the coast. It also dates back to the 1820 British Settler days with many historic buildings with direct connections to the early years. Bathurst is the kind of village which, when discovered by the big city folk, would probably loose it charm but would also create employment for many unemployed local inhabitants. 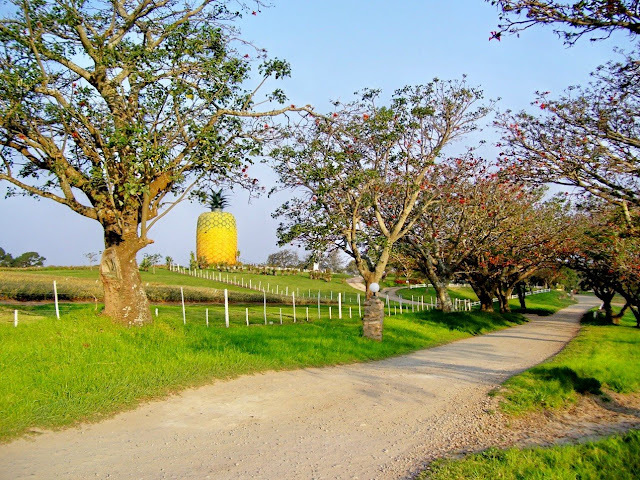 On the outskirts of town visitors will find The Big Pineapple, the biggest pineapple in the world. 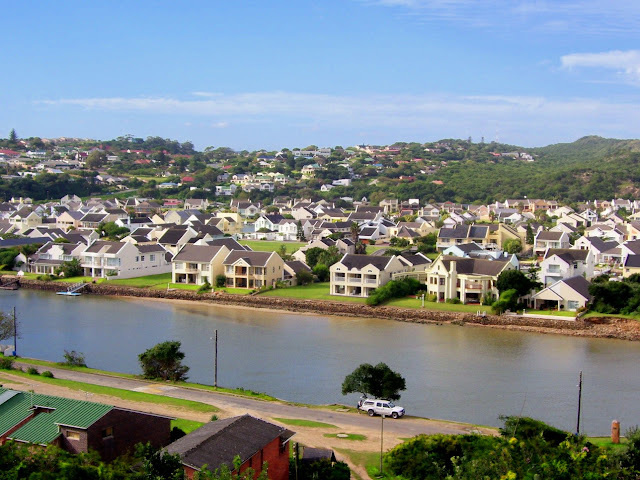 The town of Grahamstown, 120km east of Port Elizabeth, is situated in the middle of the Frontier Country. The area was the site of 9 frontier wars between the settlers and the Xhosa people over a period of a hundred years from the late 1700's. The town saw a lot of development from 1820 onwards after the arrival of the British Settlers and still have a very English feel to it. 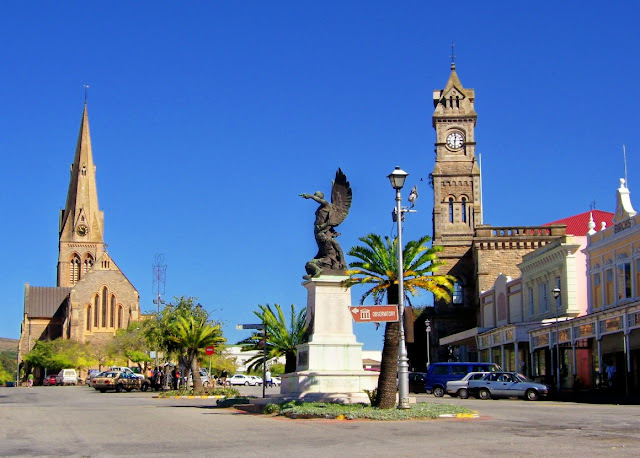 Grahamstown is referred to as the City of Saints as it has more than 50 different churches. It also hosts the annual National Arts Festival early in July, an arts festival only second to the Edinburgh Festival. Grahamstown is also home to Rhodes University and several of South Africa's top private schools. Grahamstown has a big number of historical buildings which is easily explored on foot, while there are also many natural sites in and around the town to visit. The above picture features the historic Anglican Cathedral of St Michael and St George on the left, the Angel Statue (Boer War Memorial) in the middle and the City Hall Memorial Tower on the right. Over the next three weeks or so I am going to be deviating off the traditional City Daily Photo rule of posting only something from the city and immediate surrounds and show you some of the towns and places that surround Port Elizabeth and Nelson Mandela Bay. We will be following some of the tourist routes and visit some of the interesting and quint towns that visitors to the area can see. I have been contemplating doing this for a while and now have a reason. I will be away for the next couple of weeks and unable to physically upload something new every day. I am doing some forward posting so even though I may not be here, there will still be a new post daily. We will first head to the east towards Frontier Country and back via the Sunshine Coast, then north into the Karoo and finally west onto the Garden Route. Enjoy the trip. 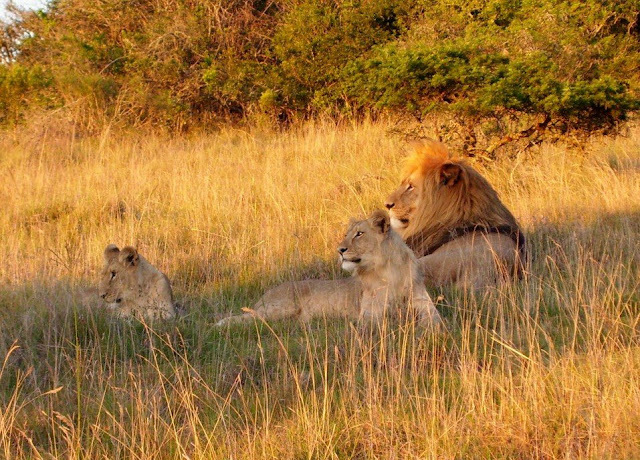 Port Elizabeth is surrounded by some of the best private game reserves in South Africa. Most of them are situated towards the east of the city and boast some or all of the Big 5 as well as luxury 5 star lodges. The big advantage this area has is that it is completely malaria free as well as at the end (or start depending on how you look at it) of the world renown Garden Route. 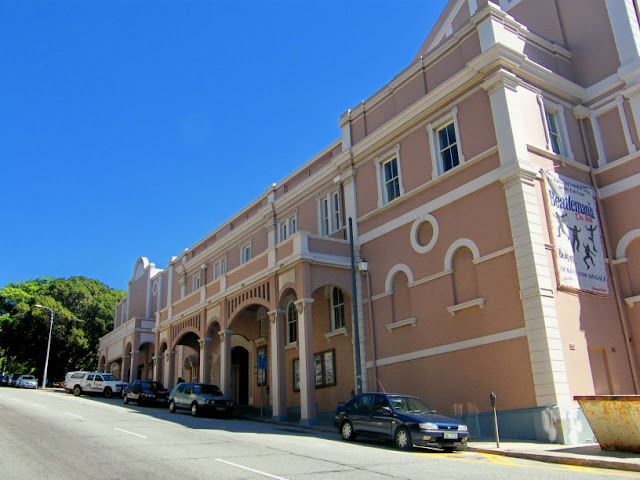 The Port Elizabeth Opera House was opened in 1892. This makes it both the oldest functional Opera House in the country as well as the only Victorian theatre in South Africa. The building boasts two theatres, The Barn which stages smaller plays while the main theatre plays host to big shows like operas, ballet and musical shows. Njoli Square is one of the busiest parts of the townships. It is where most taxi routes come together and there is normally a lot of commuters moving around to and from work. 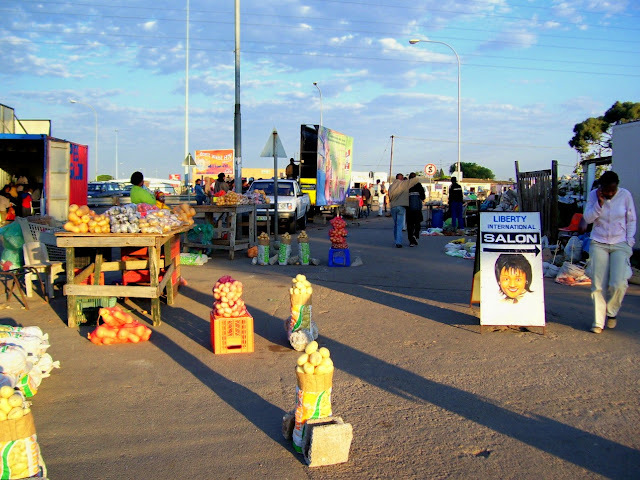 Njoli Square is also a prominent market area where you can get everything from fresh vegetables to traditional medicine or freshly made traditional food. Locals can also get their hair cut, exchange bottles for some cash or just bump into an old friend. Its one big open air shopping and social area. The shipwreck hall at Bayworld is a virtual treasure chest of wrecks and artifacts found around Algoa Bay. 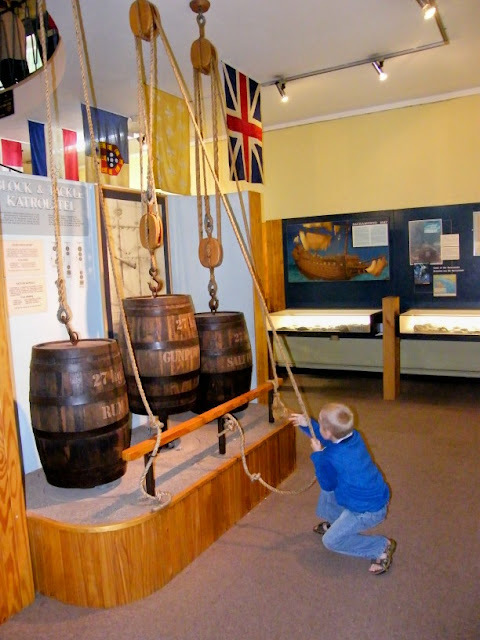 There is also a great interactive area where kids (and adults) can try out the pulley systems that was used on ships. Its amazing how 27kilograms gets lighter as you try out the three ropes. There are several huge wild fig trees in and around St Georges Park. Most of these trees are over a hundred years old and have become landmarks in the area. This one stands close to the Pearson Conservatory. Another prominent one stands on the corner of How Avenue and Park Drive next to the St Georges Hospital. Langa in Uitenhage holds a special place in the history of resistance to apartheid, as it was here that 20 people were shot dead by police on 21 March 1985, the 25th anniversary of the Sharpeville massacre of 1960. The 1985 shooting took place just outside Langa township, and became known as the Langa Massacre. There was an international outcry following this incident and a Commission of Inquiry was immediately appointed to investigate the cause of the shooting. A year after the Langa massacre, a memorial tombstone to those who died was unveiled in the KwaNobuhle Cemetery. The tombstone was vandalised in June 1987 and re-erected in March 1994. 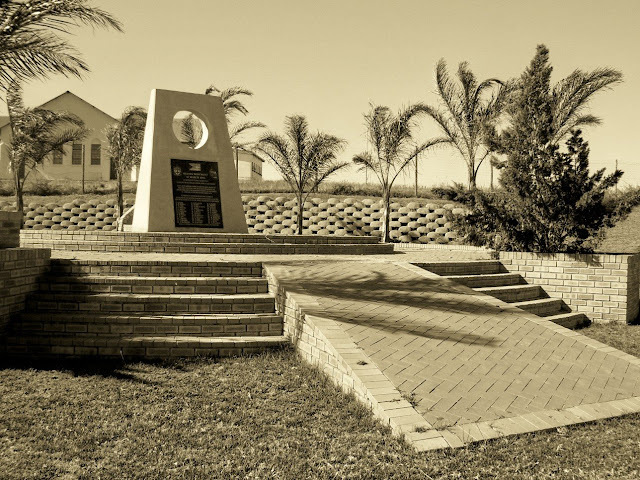 The Langa Memorial marks the spot where the police opened fire on a crowd of mourners on their way to a banned funeral. 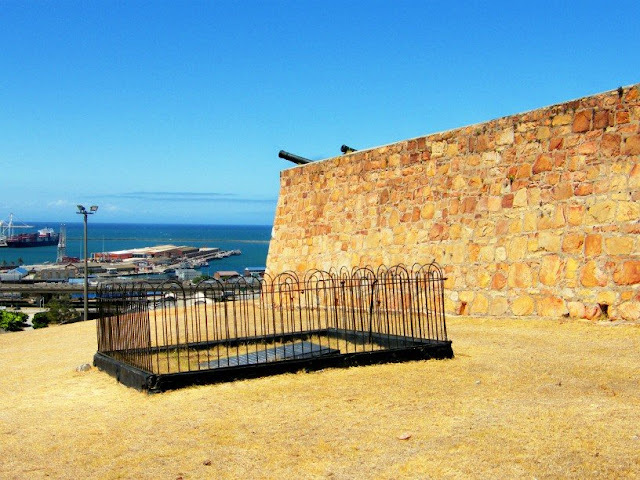 In front of Fort Frederick, Port Elizabeth's oldest building, visitors will find the grave of Captain Francis Evatt. Widely known as the father of Port Elizabeth, Captain Evatt commanded Fort Frederick from 1817 - 1847. He supervised the landing of the 1820 British Settlers who was brought to shore under the protections of his soldiers, and provided them with provisions and canvas accommodation. He was originally buried in the St Mary's Anglican Church in the city centre and was later moved to the present spot next to the Fort's north wall. Settlers Park covers 76 hectares on the banks of the Baakens River and contains an unique diversity of plant life and about 120 species of birds. Small animals like grysbok and mongoose can be seen and down by the river there are leguaan and terrapin. Various walks criss cross the park and the main entrance into it is from How Avenue just off Park Drive. 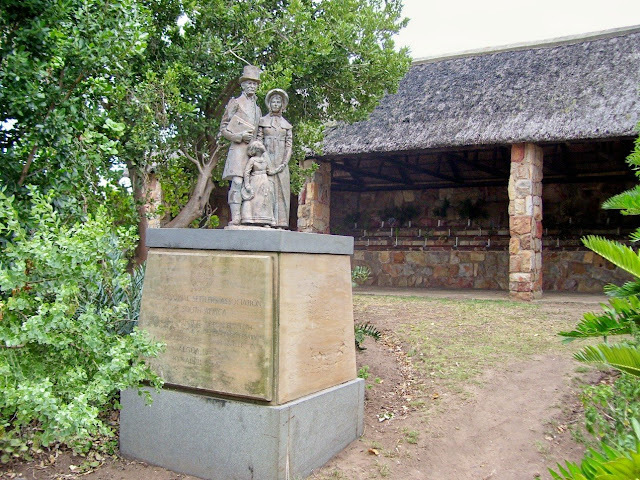 Next to the main parking lot is a flower display house along with a marquette of the 1820 Settler statue found in Grahamstown.